If you've ever played Sim City, there's a place in the budget for city beautification. Sims like parks and playgrounds—it raises their happiness and the happier your residents, the more likely people will want to move to your city. But beautification doesn't come cheap. You have to make sure that enough funds are allocated to the expense or the effect isn't really noticeable. And then the Sims start to complain. Once you've budgeted enough, a crew of invisible workers keeps your parks and playground sparkling. In real life, though they may not be a part of the mainstream consciousness, there is a fleet of workers responsible for keeping parts of the city clean. Neighborhood alliance groups have sprung up to preserve the environmental and cultural reputations of spaces. I spoke to 24 year-old Marcel, employed by the Downtown Alliance. 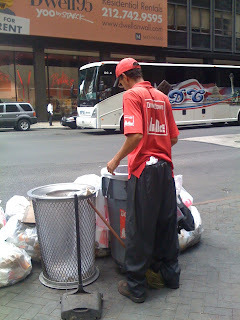 Every morning, he scours the streets of the Financial District looking for errant trash. I start early. It's easier to start early because there are less people on the streets then. I have a broom and a dust pan, and I check the streets for litter and garbage. I find a lot of cigarette butts. Sometimes—say twice for the week—I take an actual trashcan around with me. Usually it's just about maintenance though, making sure that things are kept clean. It can be hard to be outside all day. And sometimes you do feel invisible. We wear these red shirts that show we're with the Alliance, but with the work we do, it's not work that always seems to register in people's minds. People don't see us. It's hard too to see people just dropping trash on the street—I have to clean that up! It's hard in this city to think about anyone other than yourself. And I understand, we've all got problems and things to worry about. But we can't forget that we all live together in this place. So look up when you're walking down the street, and see the people around you. Make eye contact with people—our lives aren't all that different. You just dress differently for your job, that's all. And put your trash in the can, man! Send in your own submissions highlighting service professionals in your city or neighborhood. Ask the questions above—or questions of your own—get a photo if you can, and I'll share it with the blogging community.